This past weekend I had the wonderful fortune of attending my brother's wedding in Atlanta, Georgia. Trevor and his fiancée, Guneeta, have been together nearly 11 years. They have seen a lot of ups and downs over the years, including the recent loss of Guneeta's dear father. Many of you can relate to the difficultly of celebrating a major life event without someone you dearly love present in the physical body. Her family is Indian, from Punjab, and it was a mostly traditional Sikh wedding. I've never experienced anything like it, and it was so incredibly fun and colorful, it blew my mind! As soon as we landed on Friday morning, we received a text telling us to get to the house right away because wedding festivities were already underway. We were immediately immersed in a ceremony in the living room, with about 40 family members. They laid out a yellow cloth for the bride to sit upon, and she entered the room in a brilliant yellow dress, fully adorned with embroidery and beading. It was magnificent. Her cousins held a red cloth over her head, symbolizing good luck. Because her father has passed away, the bride's Uncle stood in for her Dad in the ceremony, and placed bangles on her arms, meant to stay in place for the entire first year of marriage. It was an emotional moment for everyone in the family, who lovingly wiped away tears. I wish I could say something incredible happened to show the father of the bride was with us spiritually; you know, like his picture went flying off the wall or something even more outrageous. But like most life events, we had to rely upon feeling his love and presence. In loving memory of Wg. Cdr. J.S. Ahluwalia. The ceremony itself was held the next morning at a gurdwara, the place of worship for Sikhs. I was in awe of the colors, drumming, chanting and immense love that her huge family poured out to ours. With a pink sash, Trevor led Guneeta around the altar four times; it was so heartwarming to see my brother participating in this sacred ceremony. Enjoy this 3 minute video of the events and ceremony. The fun was only beginning, and the reception was the most fun I've ever had! Amazing music, dances by her cousins and aunts, drumming, fragrant food and even more breathtaking dresses than we had worn in the morning! They guests were seriously the most beautiful bunch of people I have ever seen. Trevor did some belly dancing with the cousins and I laughed so hard tears rolled down my face. He's not a dancer...I mean, there is no rhythm there. Guneeta did a special song and dance for him, which again, was just really amazing. It made me want to sign up for more belly dancing classes. At the reception and ready to dance the night away! 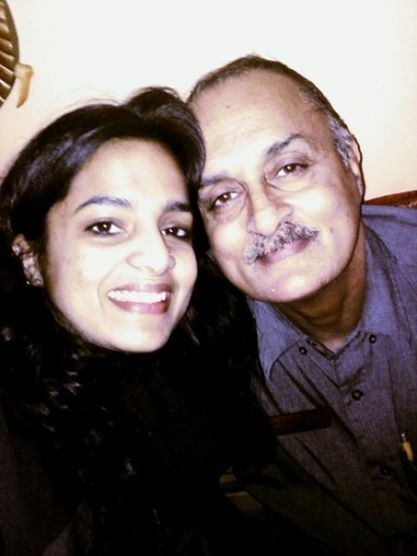 Later, Guneeta and I had a chance to talk about her Dad, and I asked if she had felt his presence during the week, or if she had recognized any signs from him lately. She said she had really felt him with her while they were taking pictures by the river. Apparently, out of nowhere, a misty fog had hovered over the water. In that moment thoughts of her Dad flooded over her, and she felt as if he were there with her. She also shared that she recently ran the Tough Mudder in his honor. She was talking to him in the car on the way to the race, asking for his support. When she opened the door to exit, her eyes landed on a little rock on the ground. She bent over, picked it up, and saw it was in a perfect heart shape. Again, she said she was comforted by feeling his presence and love in that moment. Most of us will have to face a milestone without someone we love. It's helpful to remember, though they can't submit an RSVP, they plan to attend in their own way. A person who has transitioned to the Spirit world is able to influence our thoughts most easily, making their presence known by a sudden flooding of thoughts of them, and by those sweet mental whispers of, "I love you, I am here." When you face one of those celebrations without the presence of someone important to you, remember to try and feel their love. They wouldn't miss it for the world!